IIT Students are working to develop a low-cost, scalable, solar charging solution for donated laptops in Haitian primary schools. More than 90 percent of the country's primary schools do not have electricity, which is required for charging the laptops." Pompilus [Guy Serge Pompilus, the Haitian Ministry of Education's coordinator of the country's One Laptop Per Child project] approached Baikie [Bruce Baikie, president and chief executive officer of Green WiFi, a nonprofit that provides solar-powered wireless Internet to developing countries] in 2009 at a One Laptop Per Child conference in Rwanda, where they began brainstorming how to use solar power to charge the laptops in Haiti. Baikie took the idea to Hosman [Laura Hosman, IIT assistant professor of political science], who pitched the idea for the class to IIT." 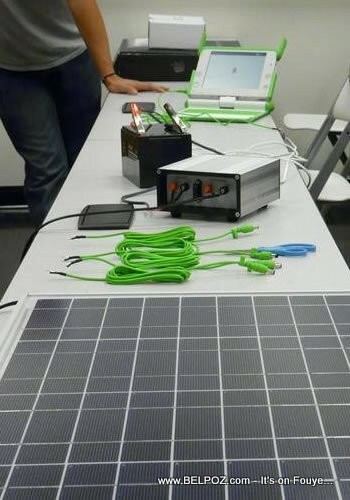 This new low-cost, scalable, solar charging system be able to last for 15 to 20 years with little maintenance, the article says. Also Read: One Laptop Per Child In Haiti... Is That Possible? Do you think it's worth $10.00 out of your pocket? « Is Haiti Poor Because of its Design? I will personally make sure it goes to the right channel. There is no administrative overhead to our project whatsoever, because we are located at a university, and the university covers the administrative costs. All of our labor is volunteer labor (the students and myself). Educating our children is very important. A 10 dollar donation would not hurt. I think it is a very good idea, but where is the money going?